Does being productive mean that you need to use every single moment in your day effectively? Instead of sleeping in, you’ll get up early and exercise. Instead of reading 50 Shades of Grey or The Hunger Games, you can make a list of classics and start reading them all. Yes, productivity does have to do with being smart about the way you use your time. However, it has another important aspect: purposefulness. If you read War and Peace in a single month, does that mean you’re being productive? Not if you’re using that excuse to procrastinate. If you have a job to do or a paper to write, even Tolstoy won’t make you feel good about delaying that work. Maybe your goal is to make a million dollars within two years. Watching Tarkovsky movies and reading the classics are good things to do in the meantime, but they will not make you productive towards that precise goal. Let’s define productivity in accordance with this approach: productivity means acting towards particular goals, with the purpose to achieve them as quickly as possible. For some people, reaching goals means having a family and providing all conditions for them to have a comfortable life. For others, the goals are related to climbing the career ladder. Another category of people have slightly different goals, aimed at personal and spiritual growth. Better productivity can help us reach all those goals. If the goals are big, we have to be patient. With proper time management, however, we can speed that process up. We have some tips that will get you to your goals faster. Write two chapters per month. Kill two characters in three chapters. Write four pages in a day. Work 8 hours per day. Let’s focus on the thing that would make this imaginary working scheme work: details. You have one major goal, and you break it down to measurable activities. You will know exactly how much you achieve throughout a day, so you’ll evaluate your own productivity. Plans make you faster, for sure. When you tell people about the goals you want to achieve, you’ll feel a great responsibility to make things happen. If George R. R. Martin told his audience to expect a book next year, he would do everything in his power to do what he promised. Sharing has another important benefit: it forms a support system. Tell your closest friends and family members about the most important goals on your list. They will support you to stay committed to them every single day. The moral of this story is simple: you have to be focused if you want to achieve goals. And, you can only be focused if you know why you’re working towards a particular aim. How does a goal make you feel? If you’re not motivated enough to do that, maybe you should shift your goals towards a different career. When your motivation levels are high, you’ll have an inner drive that will push you forwards faster than you ever imagined. Think about the current point you’re at. When you’re making goals, make sure they are achievable. Maybe you won’t make millions in a month if you start blogging today, but you can write few high-quality articles with potential of going viral. Don’t set yourself up for failure by setting unrealistic goals. Start with something you can visualize without a doubt in your mind. Let’s take two random students as our next example. Both of them have an important exam and two term papers to complete. One of these students does everything in her power to write the term papers and study for the exam. She doesn’t get enough sleep and she doesn’t even think about getting some time off these responsibilities. She may complete the two term papers, but they won’t be perfect, since a perfect piece demands at least a month of research, writing, and editing without other interferences. She won’t go through the entire studying material, simply because she won’t have enough time to do that. The other student makes a priority: the exam. He hires Australian writing service or another writing service to complete the term papers under his instructions, and he focuses on studying. A professional writer can write the content for him, but no one can study in his place. He gets both term papers by the deadline, and he gets way more time to study when compared to the other student. He is getting closer to the goal of graduating on time. That’s what we call productive. How do you think Donald Trump achieved his goal of becoming the President of USA? Commitment, commitment, commitment! When you have a list of goals and you break it down to actionable targets, you have to be absolutely, unconditionally committed to hitting each and every one of them. Let’s say your goal is to lose 20 pounds in 2017. You will have to make a daily commitment if you want to get there. You’ll have to stop making excuses, since the goal requires continuous actions. Exercise, healthy food, daily motivation to carry on, and resistance to temptations – those are the actions that show you’re committed to this precise goal. Natan Sharansky is an Israeli politician and human rights activist, who spent 9 years in a Soviet prison. While in prison, he constantly visualized chess matches. He claims that this mental practice helped him preserve his sanity. In 1996, after he got out of prison, Sharansky beat Garry Kasparov, the world chess champion. Seeing is believing: Keep that in mind. When you visualize yourself achieving those goals on your list, you’ll build the inner confidence that will get you there. If all your activities are aimed at that goal and you’re doing something every day to achieve it, then you’ll be productive. 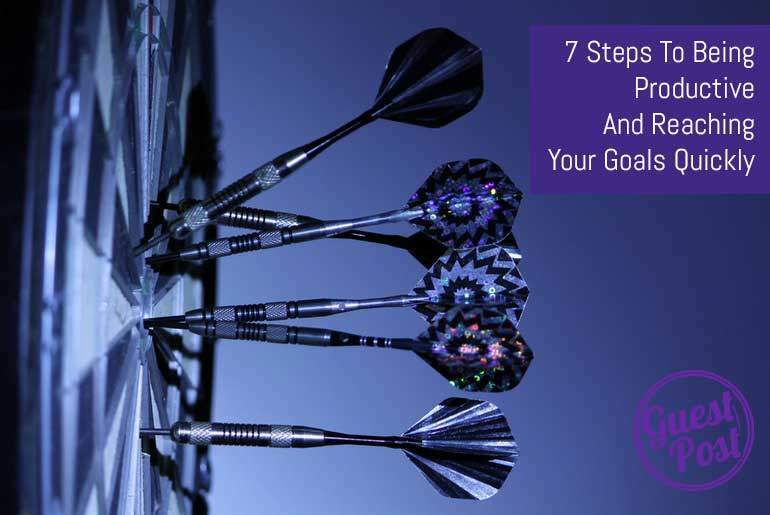 When you implement the 7 tips you just went through, you’ll definitely become a more productive goal-achiever! Jessica Freeman is passionate about content writing and journalism. She finds her calling in making others interested in topics of education, productivity, and marketing developments through her freelance work on content pieces. Meet her on Facebook and Google+.